It may surprise many to learn the US, known as the land of opportunities, is facing a major crisis the number of people below the poverty line on the increase. Though the definition of poverty varies with states and local legislation, it implies the purchasing power of individual with respect to standard of living in any nation. An individual is said to be living in poverty when the state considers him incapable of living comfortably according to his income. The projected level of poverty is about 13.2%. On reviewing the data of past years, we realize it is a cyclical trend with fluctuations from 13 to 17 percent. The chief cause is unemployment as majority of employed people have a good standard of living. This is substantiated by the fact that of the people who have full time jobs just 2.5% are poor. 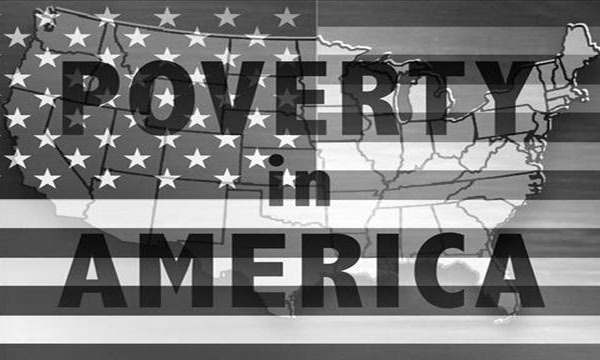 The poverty rate is the highest among African Americans plus Hispanic community, as 24.7% and 23.2% from each community are reportedly living in poverty. Another major reason is absence or inadequacy of education. The lowest earning at less than $1665 is of dropouts from high school. Relative poverty, defined as having significantly lower access to income and wealth is too high in the US. Basically, it signifies that there is a very large gap in the income of the rich and the poor. There are many reasons for poverty, but we need to find more strength and resources to end poverty. The most significant factor contributing to poverty is unemployment and job cuts. When a person loses job, the main source of income is gone. Equally significant reason is inadequate or no education at all. If children are not given education, there will be a continued increase in the number of school dropouts. That adds to the problem of unemployment as uneducated population can’t be employed gainfully. The gap in earnings of the professionals and dropouts is too wide, thus demonstrating how vital education is for removing poverty. An increasing number of people are beginning to realize that provision of food and healthcare alone can’t suffice to eliminate poverty. It is the quality of education coupled with increased opportunities of employment that can help reducing poverty in the US.